Si Coung is a good-humoured 73-year-old woman from Rakhine State in Myanmar. 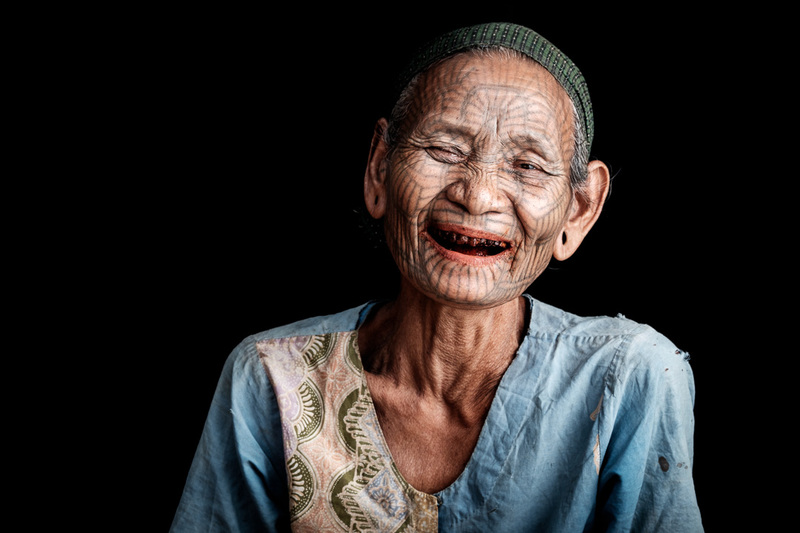 Her people, the Lai Tu Chin, are known world-wide for their distinctive spider-web facial tattoos. This pattern helps differentiate them from the other Chin peoples. She began by recalling the day she was tattooed. She really wanted to get it done, as she thought her peers were so beautiful. However, at 9 years of age, she was not quite prepared for the pain. She remembers having to be held down and calling to her brother, ever her protector, to help with the pain. The tattoo was entirely done by hand using needles fastened to a bamboo stick and home-made ink. The process caused immense swelling for days or weeks after the tattoo was completed. Once it was done, Si Coung proudly walked around the village showing off her beautiful new tattoo. “I thought I was the most beautiful woman around,” she recalls. Not now, however. She feels that the tattoo is no longer needed to be a part of her tribe and that the young people are more beautiful now. The fact remains, though, that in her time, the tattoo was required for her to participate in any cultural activities like celebrations, weddings, or funerals. She does not regret it.